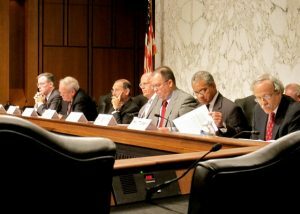 The Senate Homeland Security and Governmental Affairs Committee will meet Wednesday to consider a recent report on wasteful spending in contracts for the wars in Afghanistan in Iraq. In a 240-page report released in August, the Commission on Wartime Contracting detailed between $31 billion and $60 billion in waste, including projects that either went unfinished or are unsustainable. “This report provides further proof that vigorous management of contracts is central to successful outcomes – in government and in business,” Chairman Joe Lieberman (I-Conn.) said in a statement. The committee will hear from three panels of witnesses, including Chris Shays, who co-chaired the commission with Michael Thibault.